Cover of codex 214 made in the monastery’s bindery. 1433. The library, housed on the second floor of the renovated tower, contains a total of 400 manuscripts and more than 3,500 printed books. There is evidence that there was once a scriptorium in the tower, but it appears not to have functioned on a permanent basis, being called into use or not depending on historical circumstances. It seems that it was set up at the time of the monastery’s foundation, and its existence is evident from the conches in the tower that were shaped to facilitate the work of the copyists. In connection with the first period of its activity, the names of the calligraphers mentioned are those of Monks Ignatius, Gerassimos and Theoleptos, while in the first decades of the fifteenth century the copying of manuscripts continued with David of Raedestos and Callistus. A second period when the scriptorium was functioning on a regular basis was the sixteenth century. From this period the names of the calligraphers and copyists known to us are those of Neilos, Sabas, Paphnoutios and Michael, all Fathers of Pantokrator. During that same period, St Theophilos the Myrobletes, in his later years, continued his copying work in the kelli of St Basil in Kapsala. St Theophilos was a renowned copyist of scores of manuscripts that can be found today in libraries on and beyond the Holy Mountain. He prepared at least one codex for the monastery library, that catalogued as number 85, being the Synaxaristes from September to February, a work that St Nicodemos the Agiorite used in compiling his own memorable Synaxaristes. Parchment leaves with extracts from the Gospel. Seventh century. In the following centuries, during the period of Turkish rule, the task of copying was continued by the Fathers of Pantokrator at irregular intervals. From the Life of St Joseph Metropolitan of Timisoara we know that when he settled in the monastery at the end of the sixteenth century and was tonsured as a monk, he set himself the task of copying codices and he developed into an excellent calligrapher. From autograph notes on codices both at Pantokrator and at other Athonite monasteries we know the names of certain other calligraphers such as Melchizedek of Pantokrator (codices 402 and 448) of the eighteenth century, as well as Joasaph, Agathon (codex 369), Gabriel (codex 1411 of Vatopedi) and Athanasius of Pantokrator (codices 389 and 424) of the nineteenth century. Psalter on parchment. Codex 61. Ninth century. The Lord with the Apostles. 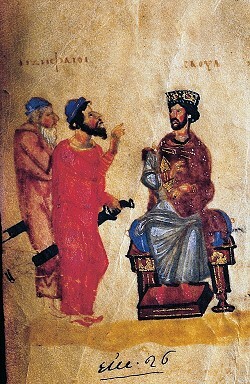 King Saul and the Ziphites. 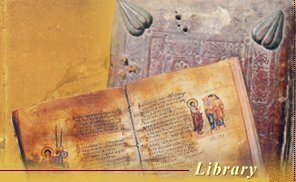 The library of the monastery today contains several rare manuscripts of excellent artistic value and great importance, coming from the Byzantine and post-Byzantine period. It may be noted that 68 of them are written on parchment as are also three liturgical scrolls from the fourteenth century. Four of the codices are written on bombazine, a special type of fabric incorporating wool and silk or cotton. Apart from the Greek manuscripts, there exist nine Arabic ones and a number of Rumanian music codices. a) Codex 61, a psalter written on parchment. It is one of the three illuminated psalters surviving from the time of the iconoclastic controversy (the first half of the ninth century). It is a palimpsest and in the margin there are 97 miniature illuminations depicting scenes from the Old and the New Testaments, examples of post-iconoclastic Byzantine art which manifested a high degree of freedom of expression. 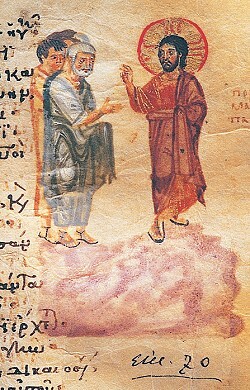 b) Codex 234, the famous Gospel Book of St John Kalyvites (mid-eleventh century). It is a manuscript of superb quality, containing a diversity of texts and unique miniature illuminations with portraits of the evangelists and other saints. Kaessarios Dapontes a learned monk of Xeropotamou, in his work Garden of Graces, includes this manuscript amongst the most valuable treasures of Mount Athos. This codex, which was specially mentioned by the English traveller R. Curzon in 1837, was stolen in 1898 but a short time later was found in Athens and was returned to the monastery by the miraculous intervention of St Menas, as tradition has it. c) Codex 10, a gospel lectionary written on parchment. This dates from the twelfth century and is illustrated with miniature headings and initial letters with flora and fauna decorations. d) Codex 47, a gospel lectionary on parchment. This dates from 1301 and is decorated with portraits of the evangelists by the noted calligrapher Theodore Agiopetritis of Thessaloniki. f) Codex 127. This dates from the mid-fifteenth century and contains works by Gennadius Scholarios, the first Patriach of Constantinople after the fall of the city to the Turks, written by his own hand. g) Codex 284. This dates back to the end of the fifteenth century and contains the six canons of the feast of the Transfiguration, composed especially for the monastery by the noted and learned Matthew Kamariotis. h) Codex 140. This is the only surviving manuscript copy of the metrical poems of the Cretan poet Leonard Dellaportas (fifteenth century). j) Liturgical Codex 266. This was written by Matthew of Myra, a well-known hymn writer and codex copyist of the seventeenth century. He presented it to the monastery in 1624, dedicating it to the “Holy and Revered and Royal Monastery of Pantokrator on the Holy Mountain”. k) Codex 13 (temporary number). This has yet to officially be catalogued and was written by the hand of St Nicodemos the Agiorite himself. It bears the title, “A new canon in eight modes dedicated to the Presentation of Our Lady the Theotokos in the Temple to be chanted on each Saturday”. The canon was composed at the request of the Fathers of Chelandari, the katholikon of which is dedicated to this feast. It should also be noted that at times the monastery went through many hardships and the library did not escape the damage suffered elsewhere. A lot of damage was done at the beginning of the Greek War of Independence in 1821, not to mention the “bleeding” that took place, resulting in the depletion of the library’s holdings by a considerable number of manuscripts that can be found today in many different libraries outside Greece. A very typical example of such “bleeding” was that carried out by the Russian Arsenios Suchanov who, on a mission sponsored by the Tsar and the Patriarch of Moscow, came to Mount Athos in the mid-seventeenth century and depleted the libraries of almost all the Athonite monasteries by carrying off hundreds of superb codices among which were 31 very valuable ones from Pantokrator. These codices, which together with the rest of the stolen Athonite codices formed the basis of the collection of the Synodal Library of Moscow (now the Historical Museum), appear in the Catalogue of Vladimir as “Book of Christ Pantokrator” or simply “of Pantokrator”, and bear the numbers 30, 84, 90, 97, 106, 122, 130, 132, 135, 171, 176, 189, 191, 197, 207, 241, 280, 306,307,326,341, 344, 348, 350, 354, 364, 369, 371, 410, 421 and 464. In addition, codices numbered 48, 49 and 69 of the collection of the Byzantine Studies Centre at Dumbarton Oaks in Washington also come from the monastery’s library, as, either wholly or partly, do codices numbers 453, 541, 813, 816 and 1904 of the Vatican Library.